You are not seeing double. 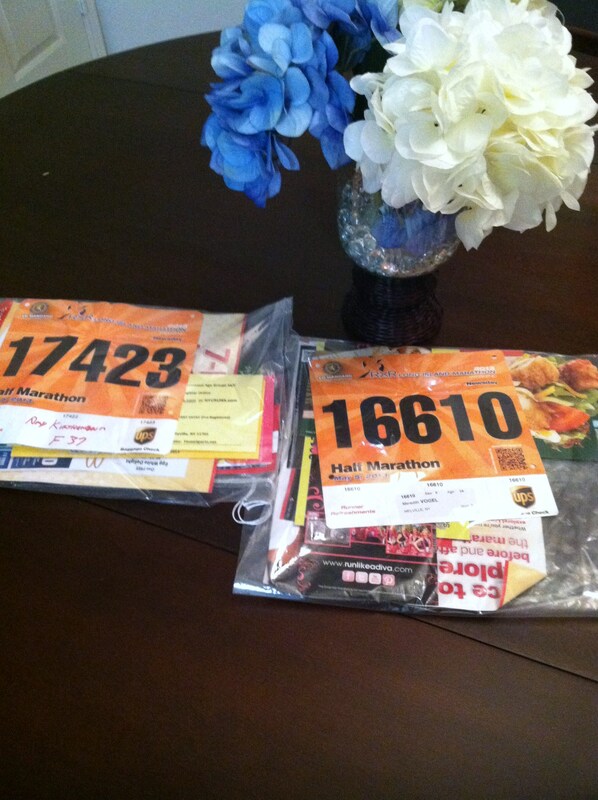 Those are two numbers for tomorrow’s half marathon. At the last minute, my cousin decided to register for the 10k taking place at the same time. And at the last last minute, I convinced her to switch her registration to the half! 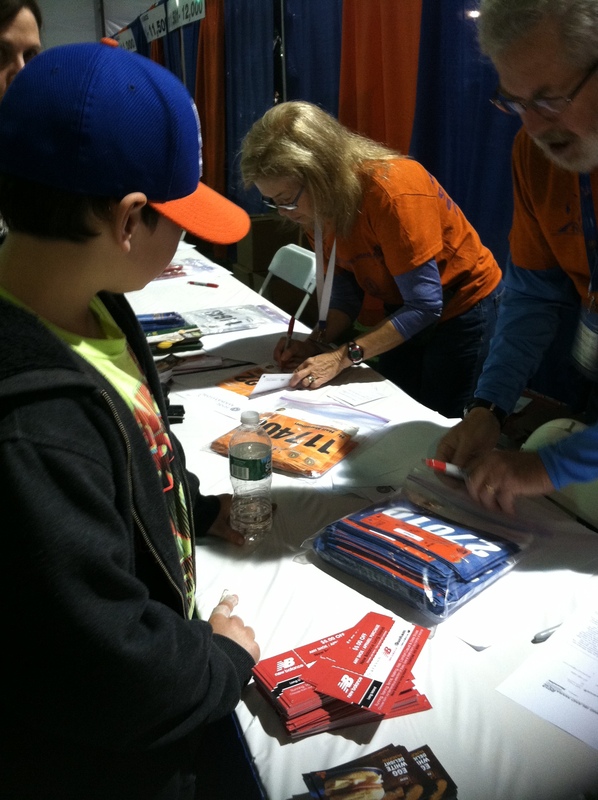 The boy and I went to the race expo yesterday afternoon to pick up my number and handle the paperwork switch for my cousin. 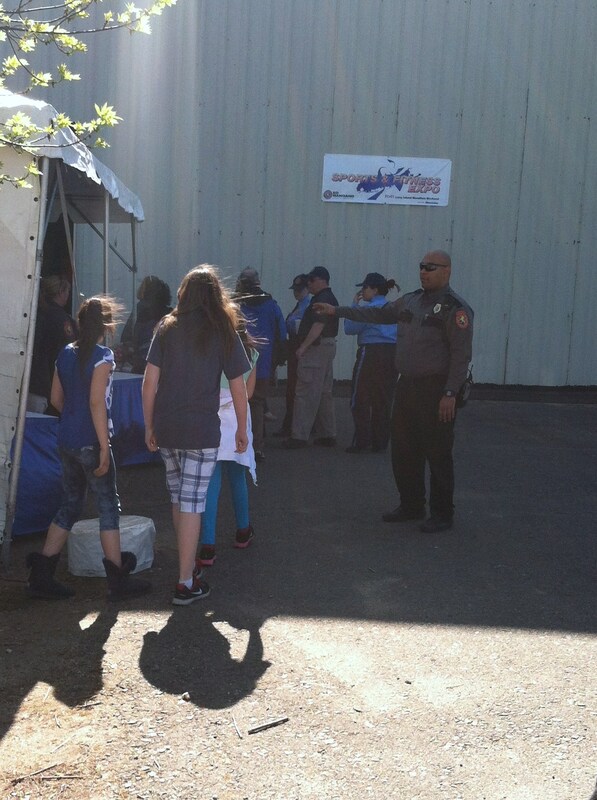 There was a ton of security in place as well as bag searches to get into the expo. For the race tomorrow, the county has added several more uniformed and plain clothed police officers, radiation detectors, security check points and random searches. Spectators are not allowed at the start line and no one without a bib can enter the starting line area. In addition, no one is allowed to bring any bags into any area of the race and if you need to carry anything at all, you must obtain a clear plastic bag given out by race officials. On a lighter note, well not actually light since it involves your stomach, arteries and overall well being, I was not so pleased to see one of the race sponsors plastering promotional materials all over the place. Sure, they were giving out apples and the boy grabbed a bag but he also grabbed a ton of coupons trying to convince me that McDonald’s would be a welcomed choice for dinner for his extreme couponing mom. 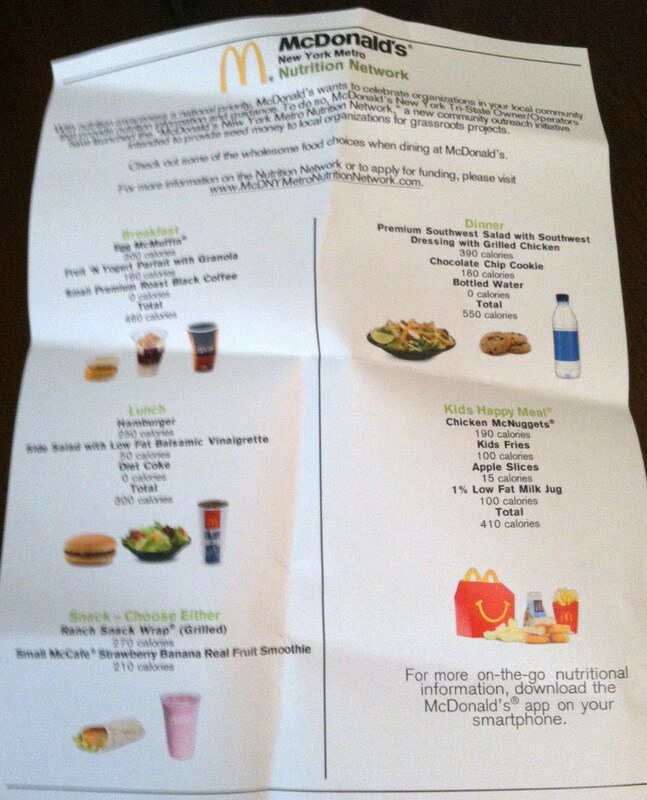 And I would have done without this “nutrition” sheet (not the best photo of the info sheet, sorry) trying to convince me that McDonald’s is a healthy family option. Remember friends, healthy, balanced eating is NOT all about calorie content. It is the food snob in me once again. Perhaps if I am stranded on the New Jersey Turnpike at a rest stop, maybe I would choose the oatmeal, yogurt, plain salad or apples, but we are talking out of desperation and a lack of finer quality food establishments. Actually, the more I think about it, I probably should have grabbed some bags of the apple slices. They would have gone nicely with a mix of Crunch Time and the Might Maple. 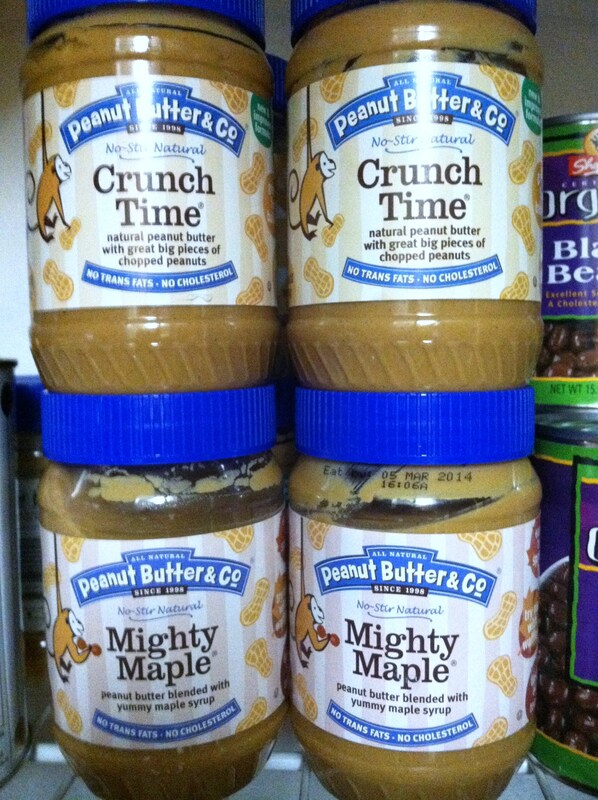 I am quite excited to have Mighty Maple back in my peanut butter rotation. It is absolutely delicious. 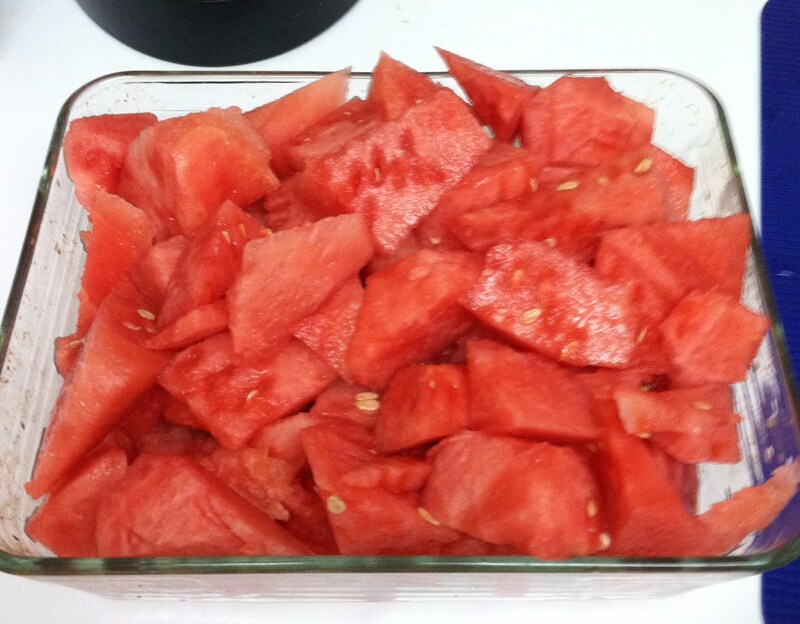 Hey look, I cut up my giant watermelon and still have plenty left to eat! The weather is beautiful this weekend and even considered a bit warm. I have been drinking a ton of water this week in addition to the usual ton to make sure I am well hydrated. The watermelon is a sweet and welcomed addition to my hydrating plan. There is a Kids Fun Run taking place this morning and, be still my beating heart, the boy asked if we can go so he can run it. He may taunt me relentlessly about my running, but clearly I am rubbing off on him in a positive way. 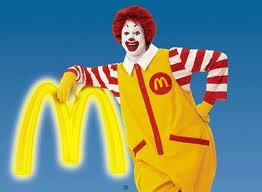 And lucky for us, Ronald McDonald will be there to cheer the kids on. I hope by now you can all sense my sarcasm. I believe they add a preservative to those apples. Not much at MacPreserve is not treated somehow. Have fun! Agreed. I’m sure there are preservatives. And they certainly aren’t my Granny Smith apples. How did McDonalds sneak in there as a race sponsor? Ick! You’re right, it’s about more than calories! Good luck at the race 🙂 That’s awesome your cousin is doing it, too! So terrible that McDonalds was such a large sponsor for this race, especially since they were the main focus of the kids fun run! – UGH!…Thank you though,,,the race was great! 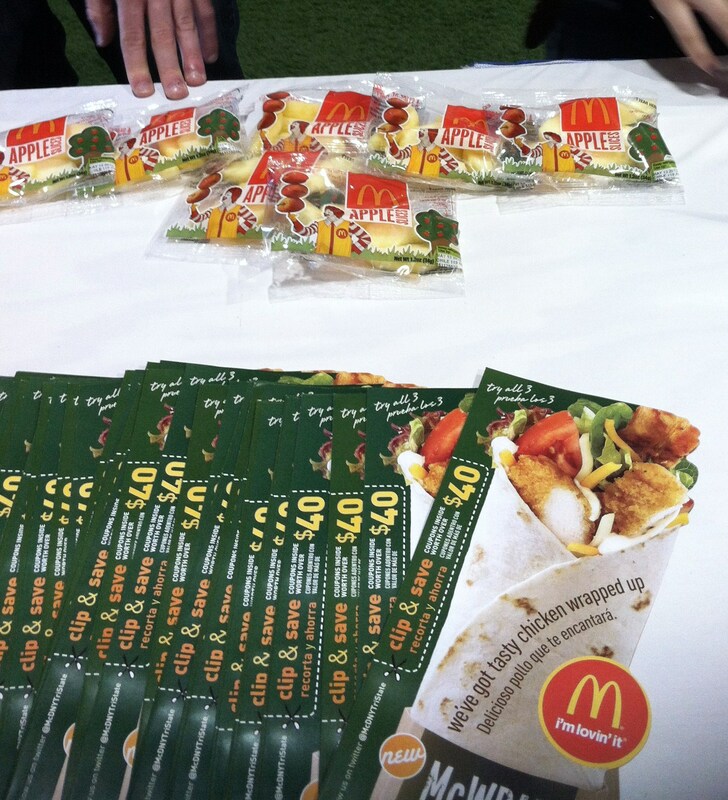 the irony of ronald as a running sponsor…oh well, at least the fitness part will ‘try’ and counteract it a bit?? ohhhh…that watermelon looks awesome! I know you did great in the race! Can’t wait to read all about it!